Leave no trace artwork  unlike other rock balancing styles, these don't leave an impression for long. 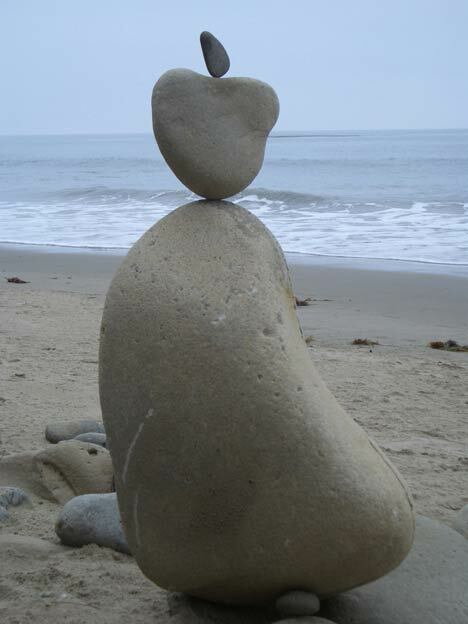 Rock balanced on remote Santa Barbara beach, winter solstice, 2001 . I balanced another rock on the same base rock, at sunset, August 29th, 2004. High tide knocked it off just after dark. 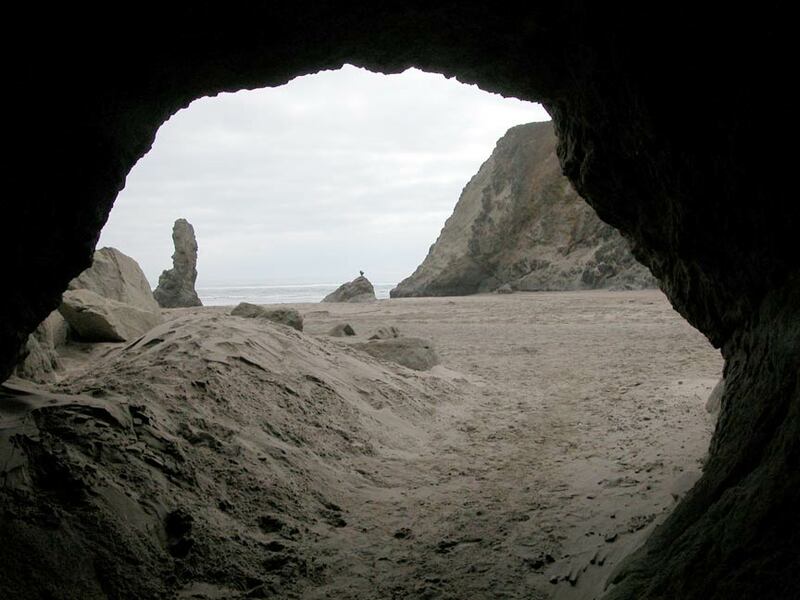 About 4 am the tide was way back out, and I looked for the rock to set it back upit was no where to be found. Instead I hunted for a new rock. The rock above called out to me in the dark, and I set it up, very pleased with the shape. Hold on, this rock seems familar...I realized it was the same rock I'd balanced on this same spot almost three years earlierit's got a real distinctive shape. Took the photo above by flash, last shot on the roll. The incoming tide knocked it down around dawn. The orientation was about 10° different from the first go, and the angle of the photo is about 5° different, which is why you can't see the concavity on the left side of the rock in the second picture. I feel like I learned something important about water and rocks from this...not sure what. Balancing rocks facilitates inner balance. Rocks balance with my analytic design mind at full rest. running full speed from rock to rock down a creek, diving into each pool and running out the other side...that kind of thing. While moving through the wild, a good base rockalways exceptionally prominentwill just capture me in its powerful energy field. Once captured, I look around for the rock that wants to balance on it. 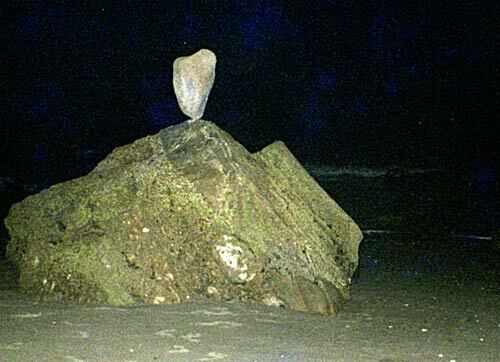 Sometimes all but a small bit will be buried under sand or other rocks, but the identity of the balance rock is nonetheless intuitively obvious. Some rocks are so heavy that it is difficult to stand them up. I lost one into the ocean 300 feet below because it started tipping and my choices were to let it go or follow it down. Sometimes the rock balances in seconds, sometimes it takes several minutes. There is a certain magic to the moment of balance. 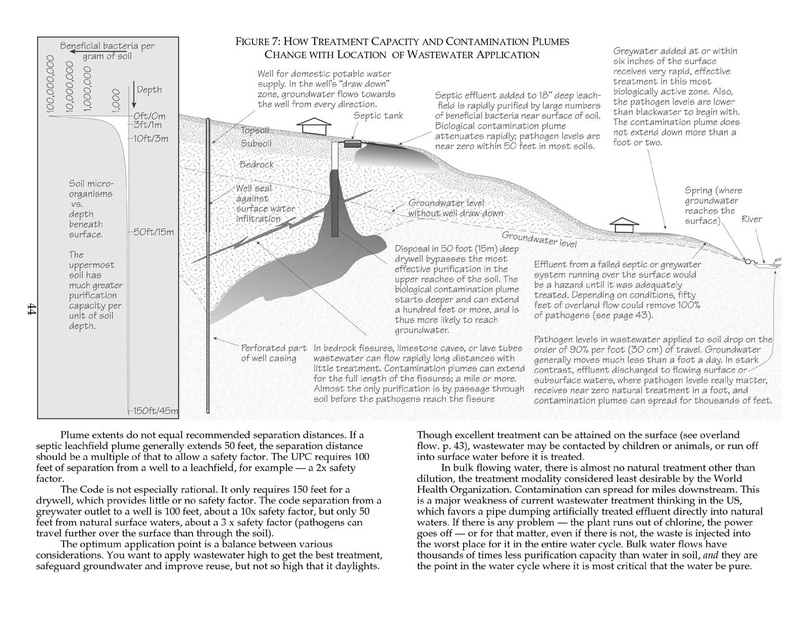 Madness is so prevailing in our world that working on ecological designs at times seems futile. I find it therapeutic to commit substantial effort to create something of magic and beauty which is so ephemeral. Sometimes the rock falls before I can turn around to look at it. Though you never know--some of the most precariously balanced rocks last the longest. I balanced rocks for years before taking the first photograph. The most powerful and beautiful were done far from any camera. Balancing rocks gets me used to working for beauty in the face of irresistible forces which may tear it down. Transferred to my work, I can embrace the crafting of beautiful designs without being paralyzed by the fear that they will shortly be bulldozed or won't matter. Some of these and many other photos are available for reprinting.